Take control of cord clutter. 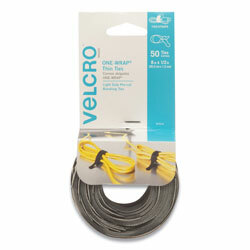 Bundle computer and electronics cords with these easily adjustable, reusable ties. The simple one-piece design wraps onto itself for a secure hold. Hook and Loop Fastener Type: Ties; Size: N\A; Fastener Size(s): 1/2 Inch Wide. Black, Gray Velcro and Fabric Grips from Velcro! 1682 In Stock today.